Never before have architects and engineers had a chance to be so creative when designing a new building! Only recently the economical and technical advancements have allowed them to build unimaginable shapes and forms. Site conditions, economical aspects, architecture, and engineering considerations open new architectural design opportunities. At the same time, designing buildings is an increasingly complex business, influenced by many different disciplines. Here in Ingrid Cloud we believe that aerodynamics must one of them! Ingrid Cloud is a wind simulation platform that makes it possible for architects and urban designers to run wind analysis in the earliest stage of the design process. 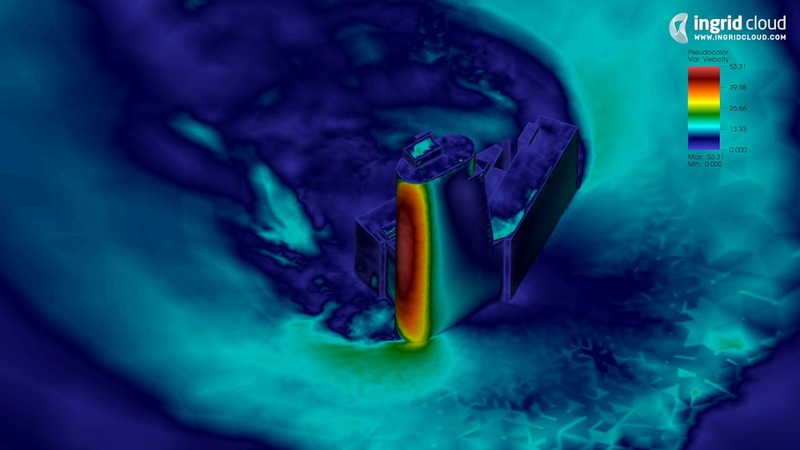 With Ingrid Cloud running even large and precise CFD simulations is a fairly simple task that will provide important data to orient their design choices. This is Bridgewater Place Tower, the tallest building in the city of Leeds, England. The wind hits the side of the building at the height of 70-100 meters and then it’s pushed downwards and around to the side. The gust is getting stronger as it reaches the street level. It is a common urban wind behavior called the Downwash Effect. Now, let’s make an experiment and add square shapes to the corners of the building to break down the wind forces. As you can see in the video below, the alternative design reduced wind velocity on the pedestrian level by approximately 20% compared to the original geometry. Listen to the wind. Understand it. Having accurate data for the wind behavior was never so easy and affordable. If you have any questions on how a wind analysis can be useful for your project, leave a comment and we’ll help you out!